Game of Thrones was already one of the best board games around, but the release of the game’s third expansion—Mother of Dragons—changes everything. It’s enormous, and adds so much cool and interesting stuff to the experience that it almost feels like an all-new (or at least third edition) of the classic. In case you’re new to the game, Game of Thrones is a military strategy title by Fantasy Flight. First released in 2003, it’s more familiar to most in the guise of its 2011 second edition, which set down the board and art that we’ve been playing with since. Think of it as a little like Risk, only instead of trying to take over the world methodically, you’re constantly shuffling your armies around, lunging at certain regions while leaving yourself hopelessly vulnerable in others. Throw in the need for diplomacy—and ultimately betrayal—and you’ve got a hell of a good time. Every other faction operates in much the same way and share many of the same core strategies, like carefully shuffling ground forces around flanks, and to always be in the business of making alliances with your neighbours. The Targaryens do none of that. It’s a completely different way to play that suited me just fine, as I love to work from the shadows and pounce at the last minute anyway, so having enormous fire-breathing dropships only made that easier for me. Even the argument that they’re overpowered vs the other houses—something I both heard from friends while playing and online from others—fits. 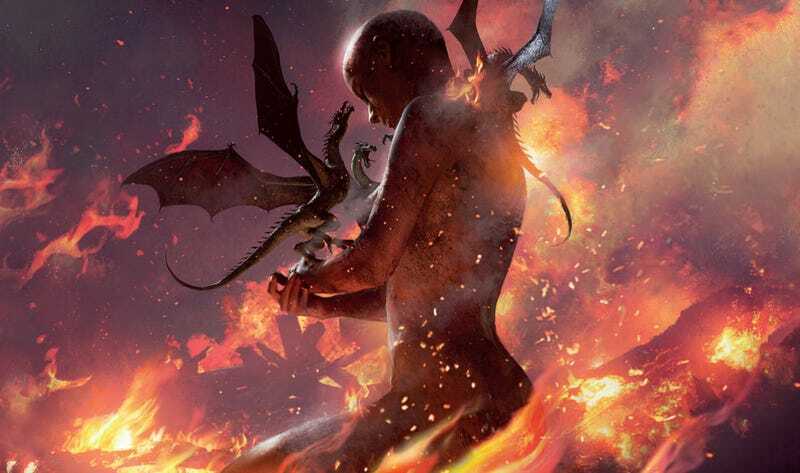 I think the point of the Targaryens is that they’re overpowered on purpose, and their presence in the game is as much about forcing the Westeros houses to work together as it is about providing one lucky player the chance to fly around with dragons. It’s a big expansion, one that fundamentally changes the way a game unfolds, and if you can ever get eight people together to play it—and are aware that you’re risking your friendships with at least a couple of them—then there aren’t many better games out there right now.